This dataset is acquired from China Earthquake Networks Center by data crawl, which describes some earthquake information about time, latitude, longitude, depth, magnitude, et al. 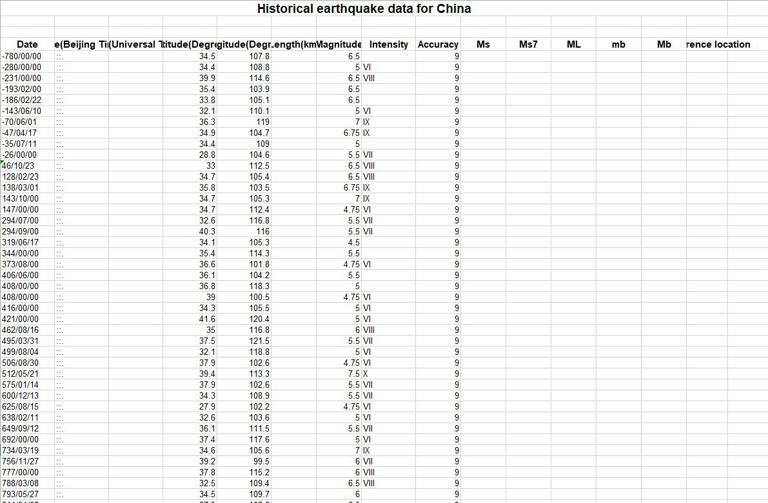 And the dataset counts the earthquake event occurred in China from 780 BC to 2015 AD, which includes 15398 data in total. This dataset can give user the information about temporal and spatial distribution of earthquake occurrence, and provide strong support for earthquake prevention, mitigation and related scientific research. This data is complete and reliable. Earthquake data for China over the years. Disaster Risk Reduction Knowledge Service of International Knowledge Centre for Engineering Sciences and Technology (IKCEST) under the Auspices of UNESCO, 2017.6.30. http://drr.ikcest.org/info/982b7.